Q What is the difference between a sole proprietorship and an Inc.? AWith a sole prop you are trading in your personal capacity which allows for easier set up and administration. In the case of an Inc., there are additional requirements in terms of regulation and administration, but it offers the benefits of Perpetual succession and possible tax benefits if structured correctly. Q What size staff complement will I require? AStaffing your business will depend on how much work you want to do in your business versus outsourcing. Staff numbers also depends on the complexity of tasks they are expected to perform and the volume of work to be processed daily. Q What is the market price for collecting debt through a bureau? AThe majority of bureaus charge a percentage of the monies that they collect on your behalf. This can vary according to the level of detailed work they are expected to perform. Q Why do I need expert Business Management advice? AFor the same reason that one consults a medical specialist for complex problems, trusting that their skill, knowledge and expertise will provide you with a solution, experienced professionals with management expertise can provide you with business solutions for a positive result. Q What is a business plan and why do I need it? AA business plan outlines all the steps you need to take to maximise your profit. It is like driving a car efficiently and effectively and avoiding accidents. Experienced professionals know the route and can give you the benefit of having travelled this journey many times. Q What are the restrictions to marketing my business in the Healthcare Industry? AA variety of laws, rules and government agencies regulate healthcare marketing. The Health Insurance Portability and Accountability Act regulates how doctors and hospitals can advertise and use customer information for marketing purposes. Please refer to the Health Professional Council of South Africa’s website found at www.hpcsa.co.za. Q Why do I need an Accountant? AAs the owner of a business you are the accounting officer and as such you need to be compliant with the legislation of the country as it relates to financial and taxation issues affecting your business. Being qualified as a Healthcare professional you would not normally know what is expected of you and the help of a professional Accountant can ensure you remain compliant, leaving you to focus on the needs of your patients. Q When must I register for VAT? AIt is mandatory for any business to register for VAT if the income earned in any consecutive 12-month period exceeded or is likely to exceed R1m. Q What are the month-end processes that I should be managing? ATypically, these would include payroll, payment of suppliers, bank statement reconciliation, VAT reconciliation, debtors’ reconciliation, cashflow management, inventory management, and leave reconciliation. Q Should I have a Facebook page? AThe question should not be whether or not all businesses should have a Facebook page but rather how does Social Media marketing integrate with your marketing strategy. If Facebook will help you serve customer needs and interests, then you should consider effective strategies to help you capitalise on those opportunities. Q Is there value in having a website? AIt’s vital to position yourself online with a strong, professional destination that gives customers the impression you mean business and the motivation to want to engage more with your business. 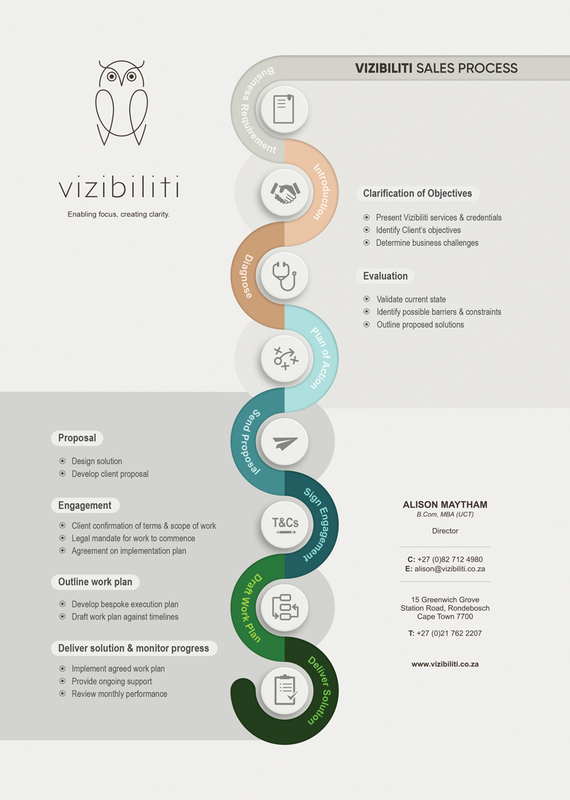 Q What happens next if I want to work with Vizibiliti?